Mauchline is a village situated about 12 miles northeast of Ayr, 9 miles southeast of Kilmarnock. The most interest in Mauchline today, is from people researching the poet Robert Burns 1759 - 1796. Burns lived at Mossgiel Farm by Mauchline, from 1784 until he set up home in Mauchline with his wife Jean Armour in February 1788. They lived in a room in what is now the (Burns House Museum) in Castle Street. Burns and his family moved to Ellisland Farm by Dumfries in 1789. Burns time at Mauchline was eventful as he met his wife, a local woman Jean Armour in 1784, had a daughter to a woman from Tarbolton named Elizabeth Paton in 1785, had an affair with "Highland" Mary Campbell in the summer of 1786, and fathered a son with Jenny Clow in 1788, who he met while in Edinburgh promoting his work. The love affairs, and the town of Mauchline, are said to have inspired Burns to write many of his finest works, referred to as The Golden Years. 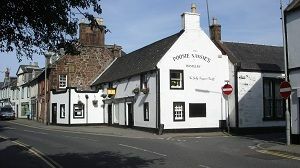 The village has a number of buildings linked to Burns, such as the Burns House Museum where he lived, Poosie Nansies Inn where The Jolly Beggars Howff was situated, Mauchline Castle where Burns is believed to have married Jean Armour, and the National Burns Monument opened in 1898. The monument has been used as a Tourist Information Centre and Museum in the past, but is rarely opened today. 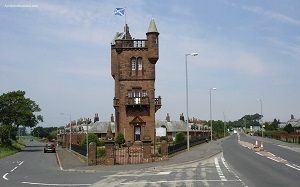 It is situated on the west side of Mauchline (traveling towards Kilmarnock). 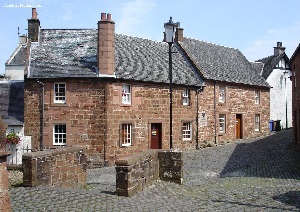 The Burns House Museum, as seen in this image, is situated in the centre of Mauchline on Castle Street with period buildings and cobbled streets. The museum contains a period room where Robert Burns began his married life, a display of Burns memorabilia and gives information on Burns life in Mauchline (1784-1788). The museum may be open Tuesday-Saturday 10.30-1700 and 14.00-17.00 on Sunday’s. Check opening times Tel: 01563 576 000. 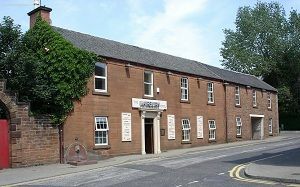 Mauchline Church is also situated in the village centre next to the Burns House Museum. The church was completed in 1829, 41years after Burns had left the village. 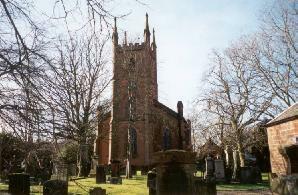 Mauchline Church is built on the site that previously held St Michael’s Church built in the 1200s. 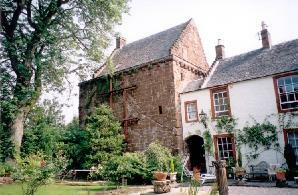 Mauchline Castle, as seen left, was built in the 1400s as a monastic residence for Melrose Abbey. Robert Burns is believed to have married Jean Armour in the castles dining room. With the castle now being the family home of Alexander Hamilton, it is not open to the public. However, you do get rear views of the castle from the cobbled streets around the Burns House Museum. The oldest parts of Poosie Nansie’s date back to the 1700s. This tavern, that may have been a brothel in the times of Burns, inspired Burns to write the cantata Jolly Beggars. Meals available from 12.00 - 15.00 Monday to Friday, 12.00 - 20.00 Saturday and Sunday. For enquiries phone 01290 550 316. Across the road from the Tavern is the Fairburn Hotel, a former coaching inn named the Loudon Arms. On the front of the hotel is a 'spout' where residents and travelers have drawn water for generations. The water from the spout comes from a geological formation in the district. In the centre of Mauchline, at The Cross, is the Labrary with a Statue of Jean Armour in front. The statue is made of bronze, unveiled by Lady Hagart-Alexander of Ballochmyle on the 30th November 2002, St Andrews day. The statue looks toward Castle Street where Jean and Robert lived. The 5,972-yard par 70, Ballochmyle golf course, is situated about two miles northeast of Mauchline, off the B705. This is fine looking course with tree lined fairways that welcomes visitors, prices around £28 per round. The clubhouse offers full catering and bar facilities. Bookings/price check, phone 01290 550 469.